It all comes down to this. 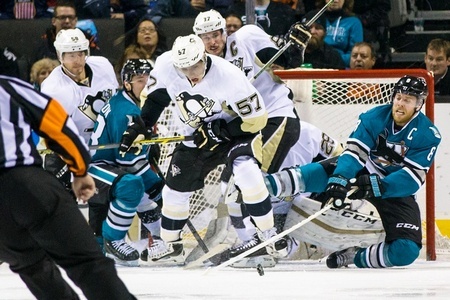 The Pittsburgh Penguins and the San Jose Sharks will meet in the Stanley Cup Final. For the Sharks, this is the first kick at the can in their 25-year history. Pittsburgh will be making their fifth trip to the Final, but their first since 2009. And in 2009, by the way, they won it all. It’s interesting to consider where these teams were in December of 2015. The Sharks were 14-14-1, fourth in the Pacific Division and two points up on the last place Anaheim Ducks. The Penguins were 15-10-3, with a new coach in Mike Sullivan. But after December reached its midway point, both teams turned it around – big time. Sidney Crosby is out for his second Stanley Cup. Patrick Marleau and Joe Thornton will be out for their first, as the two longest-tenured Sharks hold a combined 3,093 regular season and post-season games. Marleau has 1,576 games in 18 seasons with San Jose. The Penguins have found their man in Matt Murray and there’s no looking back. The Thunder Bay native, who turned 22 on Wednesday, has been a dynamo in the post-season and he’ll have the hot hand going into Monday’s action. He’s 11-4 in these playoffs, with a .924 save percentage and a 2.21 goals against average. Marc-Andre Fleury, who had a chance in Game Five, is on the back burner for now. The Sharks have pulled quality hockey out of 26-year-old Martin Jones. He’s 12-6, with a .919 save percentage and a 2.12 goals against average. He’s posted three shutouts so far. It’s also interesting to consider that James Reimer is part of this Sharks franchise. He’s seen a half-hour of post-season action, where he allowed a goal in seven shots. Brent Burns and his unruly beard will drive the Sharks from their own end. He has 20 points in 18 games, including six goals. Pairing him with Paul Martin allows for a nice counterbalance, while 29-year-old Justin Braun could also be a factor. He put up big minutes against St. Louis and gets in the messy areas to block shots and create turnovers. The loss of Trevor Daley hurts the Penguins, even if they have made the right adjustments so far. The 32-year-old from Toronto put in serious minutes against the Lightning prior to injury, but there’s enough depth in Pittsburgh to weather the storm. Kris Letang will again take the lion’s share of activity, as he logs nearly a half hour of ice time a game and has 10 points in 17 playoff games. This is Crosby’s chance to cement himself as one of the all-time greats and you can bet he’ll be ready. The well-publicized slow start is in the rearview mirror and he’ll be the most-watched player against the Sharks. That’s good news for the other forwards, as Bryan Rust and Phil Kessel can sneak past coverage and put points on the board. Speaking of Kessel, his line with Carl Hagelin and Nick Bonino is the best line on the Penguins. Not only do they have a sandwich at Primanti Bros. named after them, they’ve been responsible for a combined 45 points. The Sharks will have to contain the HBK Line to stand a chance at putting away the series. Joe Pavelski has been leading the Sharks by example in the post-season. His 22 points in 18 games have been integral, plus he’s often put in over 19 minutes of ice time a game. He has 13 goals in just 61 shots and has been playing efficient hockey, helping teammates like Logan Couture get good looks. Couture has 24 points and should be a big factor against the Penguins. Marleau could also have a big series. The 36-year-old is looking to hoist the Cup for the first time and he can still handle his business. He has a dozen points in 18 games and usually floats over 17 minutes a game. And Thornton, fresh off being named to the Canadian World Cup roster, will also be a threat. Pittsburgh defeated the Sharks last time they met in the regular season. That was way back in December, when the Penguins were coming off a 11-game winless streak and needed the 5-1 win. The victory gave them a shot in the arm and they turned their season turned around. The Penguins and Sharks are two transformative teams and many people probably wouldn’t have picked them to face off for it all in the Stanley Cup Final. That speaks to how close of a series this will be, with two deep (and wide) clubs gunning for the finest prize in pro sports. And when the dust settles, the team that made the fewest mistakes will hoist the Cup. Given the available data, I’m predicting a San Jose Sharks victory in seven games.